North Dakota became the 39th state in the Union on November 2, 1889. 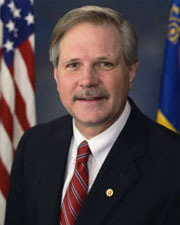 North Dakota's first two senators, Gilbert A. Pierce and Lyman Casey, were sworn into office on December 4, 1889. North Dakota's longest-serving senators include Milton Young (1945-1981) and Quentin Burdick (1960-1992). Among those who rose to leadership positions are Milton Young, who served as the Senate's president pro tempore and as Republican Conference secretary, and Byron Dorgan, who served as chairman of the Democratic Policy Committee.